The Marshalton Inn will host a “History on Tap” program Monday night from the Chester County Historical Society. Celebrate Native American Heritage Month by learning about the life and ways of the native Lenape in the Brandywine Valley through archaeological discoveries, courtesy of the Chester County Historical Society (CCHS). CCHS’s “History on Tap” series, which brings history to the casual atmosphere of area bars and restaurants, will present Dr. Heather Wholey, an associate professor of anthropology at West Chester University, on Monday, Nov. 4, from 4 to 6:30 p.m. at the Marshalton Inn. Wholey, an expert in Eastern Woodland Native American archaeology, will provide evidence and address myths about Native Americans who lived in the region prior to European colonization. Sponsored by Susquehanna Bank and WCHE 1520AM, “History on Tap” programs are free with lots of great food and drink available for purchase. 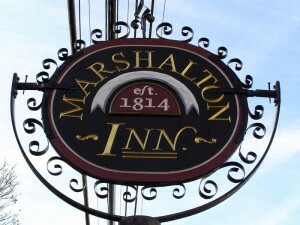 The Marshalton Inn is located at 1300 W. Strasburg Rd., West Chester, 19382. For more information, visit www.marshaltoninn.com.